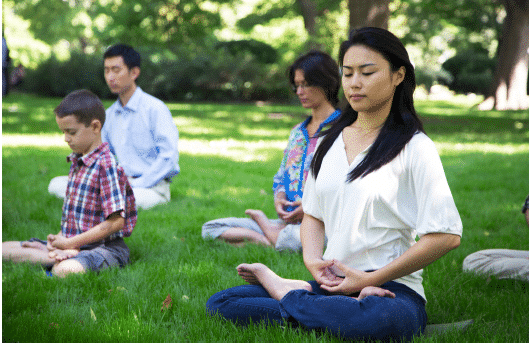 Falun Dafa, also known as Falun Gong, consists of four gentle exercises and a sitting meditation that help improve mental and physical well-being. 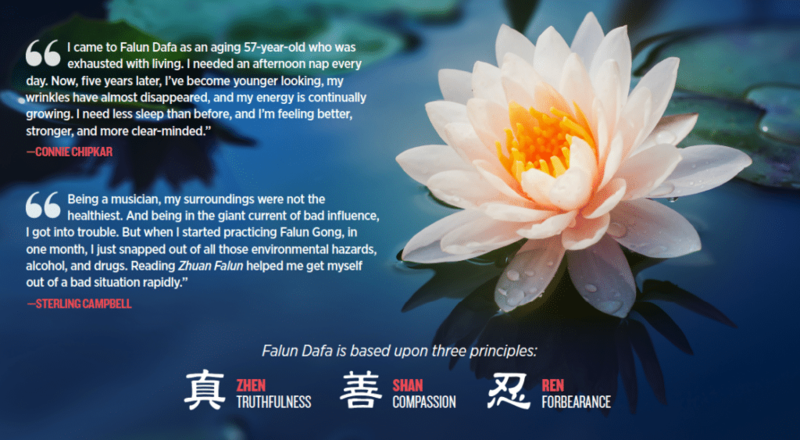 In addition to the exercises, Falun Dafa emphasizes self-improvement through following the universal principles of Truthfulness, Compassion, and Forbearance. Through this process one elevates one’s “heart-mind” nature, known in Chinese as xinxing. Why Are There Public Appeals? Every day, in over one hundred countries around the world, practitioners freely and peacefully practice Falun Dafa for their own physical and spiritual well-being. Yet in one country, not only is the practice banned, but massive persecution rampantly takes place: China. In the 1990s, Falun Dafa became widely popular across China and was endorsed by the government. By 1999 one hundred million people were practicing Falun Dafa. Such a large number of civil and kind individuals seeking self improvement should naturally be seen in a positive light. But that July, then Chinese Communist leader, Jiang Zemin, launched a violent campaign to “stamp out” Falun Dafa, viewing its revival of traditional spiritual values as a competitor to the Communist Party’s atheist ideology and its popularity as a threat to his regime’s political control. Falun Dafa thereafter joined the long list of the Communist Party’s victims and millions of people’s lives were turned upside down. For the past 18 years, Falun Dafa practitioners have been illegally abducted, sent to forced labor camps, and even tortured to death. Mass state-run hate-propaganda campaigns against Falun Dafa have dehumanized its practitioners, where only several years before the practice was promoted and heralded by the Chinese government as an exemplary practice of true, traditional Chinese virtues. This campaign has led to prisons and hospitals forcibly extracting organs from healthy yet incarcerated Falun Dafa practitioners for sale and profit to fuel a booming organ transplant business in China. In a report published by Freedom House in February 2017, the human rights group said it had found “credible evidence suggesting that beginning in the early 2000s, Falun Gong detainees were killed for their organs on a large scale.” Other experts have estimated the number of practitioners killed for their organs to be in the hundreds of thousands. LEARN MORE: Understanding the Falun Dafa human rights issue will help to understand its severity and importance. Visit www.FalunInfo.net to learn more. LIKE/FOLLOW US:The Falun Dafa Information Center puts out regular updates and announcements. Follow us on Facebook @FalunInfo and keep up to date on one of the most dire human rights crises in the world today. SHARE: Tell your family, friends, and colleagues, about what is happening in China. Sharing a statistic, a photo, or a quote will help more people become aware. Add the hashtags #free2meditate and #falundafaisgood.